30" Long Duet Deluxe Adjustable Bench With Music Storage, 14" Wide, 18.5" Tall Adjustable Up To 21", Wooden Knobs, Extra Padded, Matching Color Leather Top With Deep Diamond 13 Tufted Buttons. 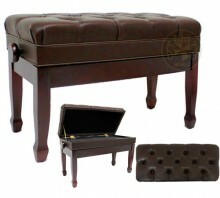 This bench comes standard with G Legs (Spade). Click the button below to add the 30" Satin Mahogany Long Duet Adjustable Piano Bench with Music Storage Spade legs to your wish list.